To illustrate the way minor metals distribute during major metal primary production and to indicate the losses during production of minor metals as byproducts, consider the following examples. Rhenium is volatized during the roasting of Re-containing copper and molybdenum concentrates (Figure A1.1). Of the Re, 15% is present as dust, the rest is in the gas phase so that scrubbing of the off-gas is necessary to recover 85% of the Re from the concentrates for further treatment to recover Re. If the scrubber is not optimized for recovering Re, this material (ca. 85% of Re input) will be lost. Much less favorable is the recovery of gallium from bauxite (aluminium ore) during the Bayer process (Figure A1.2). Gallium, together with the aluminium, is leached from the bauxite ore as hydroxides. At the end of the crystallization or fractional precipitation route, about 10% of the Ga present in the bauxite has been recovered (Phipps et al. 2007). Very typical is also the distribution of the minor metals over the material streams. 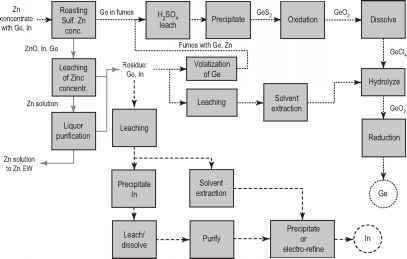 Germanium present in zinc concentrates is volatized during the roasting of sulfide zinc concentrates and has to be captured in the off-gas treatment and from there is further recovered (Figure A1.3). Part of the Ge remains in the roasted zinc concentrate, and in the next process steps Ge remains in the residue after the zinc is leached out. The Ge can be recovered from the residue when present in sufficient amounts and when the technology is installed, by leaching or volatization (Figure A1.3). A Ge recovery of 60% has been reported from the zinc-leaching residue (Jorgenson and George 2005). Copper is one of the carrier metals (also nickel, lead) that also dissolves minor metals. During Cu smelting gold, silver, selenium, tellurium, and platinum group metals, among others, dissolve in the blister copper and are concentrated in the anode slimes during electro-winning (Figure A1.4). The anode slimes are treated to recover the precious metals and special metals. Different general process layouts are given in Figures A1.5-A1.7. The pyro- or hydrometallurgi-cal processes are in reality more complex than shown in the figures. Both Se and Te are found in the anode slimes. To get an idea of the content and recoveries of the metals, the Se content in the slimes is 5-25% (Butterman and Brown 2004), which is about 25-70% of the total Se entering the process; the rest is in the off-gas of the smelter (Ullmann 2002). The USGS assumes a Se recovery of 0.215 kg/t electrolytic Cu recoverable, and for Canadian resources 0.64 kg/t. 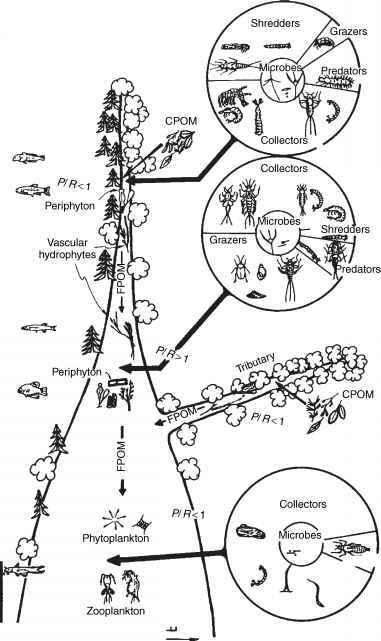 The recovery of the Te from the slimes during leaching is about 70-90% (Figure A1.7) (Ullmann 2002). 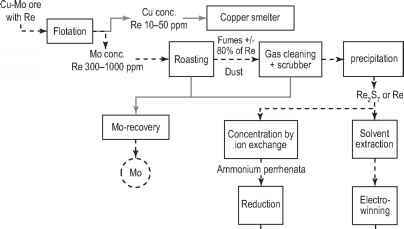 Figure A1.1 Flow sheet of rhenium and molybdenum production as by-products from copper, based on information from Ullmann (2002). 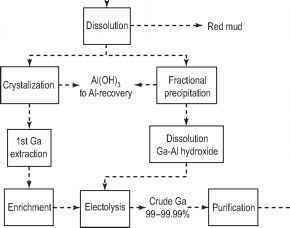 Figure A1.2 Flow sheet of gallium production as by-product of aluminium/ bauxite, based on information from Ullmann (2002), Phipps et al. (2007), and Hoffmann (1991). Figure A1.3 Flow sheet of indium and germanium production as by-product from zinc production, based on information from Jorgenson and George (2005), Ullmann (2002), and Hoffmann (1991).